Corey Long uses spray paint can against white supremacists in the Unite the Right rally in Charlottesville, Va., on Aug. 12, 2017. The commonwealth of Virginia, not known to be the friendliest place for black defendants, has given the young man who used a spray-paint can and lighter to defend himself against gun-wielding racists 360 days for disorderly conduct (all but 20 were suspended). Corey Alexander Long, who was a counterprotester at last August’s Unite the Right rally in Charlottesville, Va., where at least one person was killed, was found guilty when he went before a judge on Friday. 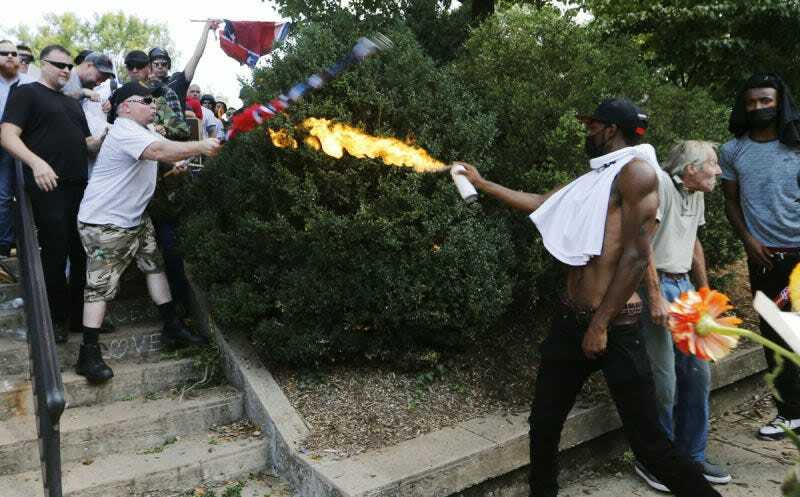 As reported by The Root, Long claims that he was acting in self-defense on Aug. 12, 2017, and was protecting another man when he used the makeshift flamethrower. He alleges that armed white supremacist Richard Preston threatened him by aiming a gun at his head and then fired a bullet into the ground at Emancipation Park that day. He also said that while this was happening, police stood around and did nothing. “He made an ethical decision to stand up against racism and injustice, and sometimes standing up against those decisions, you’ll be rebuked by the American court system,” said Malik Shabazz, Long’s legal adviser, according to NBC 29. However, the judge in the case determined that Long’s actions were dangerous to the public and sentenced him to 360 days in jail but suspended all but 20 days. The now 24-year-old will also be made to complete 100 hours of community service. An assault charge was dropped when the alleged victim, Harold Crews, did not show up in court.